Whether you are preparing a presentation or trying to sharpen the marketing message of your product or business - when looking for advice, you will soon come across the recommendation to try storytelling. Stories, it seems, help your audience to better understand and remember whatever it is you are trying to tell them. But do stories really work and if they do, why do they work? All the books and articles on the topic of storytelling that I've found so far only quote anecdotal evidence. Yes, it does seem to work, but there's this nagging feeling that the effect of stories is not quite confirmed yet, which leaves you asking for definitive proof. 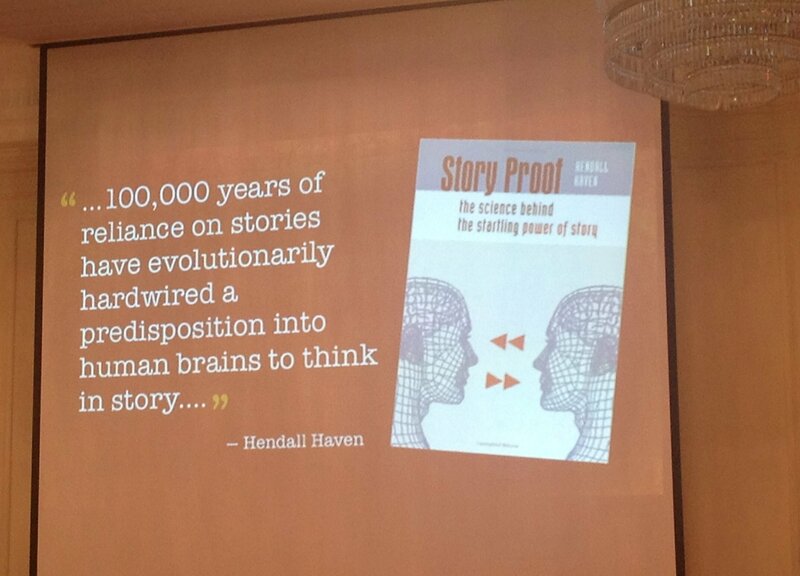 That proof is finally here, in the form of the book Story Proof by Kendall Haven. Actually, scratch the "finally" - the book originally came out in 2007 but I hadn't heard of it until Garr Reynolds mentioned it in his Presentation Zen Storytelling Masterclass in London last November. The author is a "professional storyteller" and also teaches storytelling classes. He conducted some of his own research on the positive effects of stories and started looking for confirmation in the work and research of others. After an introduction, Haven looks into the definition of what a "story" really is - and comes to the conclusion that none of the popular dictionary definitions really help. So for the next four chapters, he takes a detour trying to come up with a better definition. While this detour is slightly frustrating (we're waiting for the promised story proof! ), it's also fascinating and provides a lot of background information. For example, we get an insight into how the brain works and how it processes stories. The author also gives many examples that show how we try to make sense of seemingly unconnected sentences; we are hardwired for stories and we try to find them everywhere. So in addition to arriving at a better definition of "story", this detour also helps to convince us that there really is something about stories and their effectiveness. Story, n.: A detailed, character-based narration of a character's struggles to overcome obstacles and reach an important goal. This definition shows that to have the desired effect, a story must be based on a character that the audience cares about. It can then take us on a journey of that character's struggles. Note that it doesn't ask for a happy ending. The mind-boggling and extraordinary truth is that each and every one of these thousands of independent sources agree with the premise that stories work, that they are effective and efficient. I could not find one shred of evidence to suggest that stories aren't effective vehicles to teach, to inspire, to inform, and to educate. The bibliography for the book is 19 pages long and lists over 400 studies, papers and articles, all dealing with stories, their effects, and related research. The evidence is so overwhelming that I found myself thinking Enough already, I believe you! halfway through that part of the book. The author looks at the reports of the effect and effectiveness of stories in various areas (teaching, business, etc.) - and the result is always the same. Stories help people remember and understand things better. There are even hints that dealing with stories and their structure improves abilities in unrelated fields, such as maths. Stories - is there anything they can't do? If you ever doubted that they work, this book will convince you otherwise. In summary: This is an important book. The author meticulously goes through all the available research and reports on the effectiveness of stories and comes to the unsurprising and overwhelming conclusion that, yes, stories do work. That is, if done properly (see the definition above). If there's anything to criticise, then maybe that the book is almost trying too hard to convince the reader. The second part, where the author goes through all the fields and lots and lots of studies, can be a bit tedious and overwhelming. By that point, you will be convinced already. I can probably highlight the importance of the book with an anecdote: I was reading the book on a train ride. When I put it aside to make some notes, the lady sitting next to me asked if she could take a look at it. She turned out to teach storytelling to children and was delighted to find a book that confirmed the importance of her work. If you know somebody who's working with stories (in whatever field) or who's skeptical about their effectiveness, give them this book. 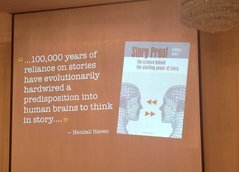 "Book Review: Story Proof" by Dirk Haun is licensed under a Creative Commons Attribution-ShareAlike 4.0 International Licence.